Clinically-designed brain workouts pack a powerful cognitive punch. Daily challenges keep women coming back for more. Research shows that performance improvements in brain games carryover into better performance in daily life. Grey matter really does matter to women. Achieving mental acuity should be both engaging and fun according to DaisyBrains.com. Almost 70% of new Alzheimer's patients will be women. Many women complain of brain performance fluctuations during pregnancy and menopause. And women are twice as likely to suffer from depression as men. Grounded in the latest research in neuroscience, DaisyBrains.com offers games that focus on memory, concentration, reasoning and verbal fluency. "Women are showing tremendous interest in exercising their brains. Research shows that performance improvements in brain games carryover into better performance in daily life," says Claire Herring, speech-language pathologist and co-creator of Daisy Brains. Unlike other brain training systems on the market, Daisy Brains includes both clinically-designed brain games as well as right-brain activities in the form of creativity exercises. Drawing challenges encourage innovative thinking. Artful results are displayed in the public gallery for admiration and recognition. Women can sign up for a free introductory membership and explore everything from brain games to creativity challenges. Members may then select a paid subscription to enjoy hundreds of inspiring brain exercises. As members improve, they earn points and move up levels in Daisy Brains. Donna Brooks, a school counselor from Noblesville, Indiana says, "Daisy Brains is the perfect addition to my daily routine. I feel sharper and more articulate after playing word games like Lemonade Letters. Drawing challenges are my favorite. I haven't felt this creative since college." 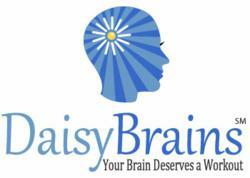 Newly launched in February 2012, Daisy Brains has seen strong interest from consumers. The company plans to expand its release outside of the United States this spring. Daisy Brains is headquartered in Richmond, Virginia. For more information please visit http://www.DaisyBrains.com.